The rifle above is a curious example of weapons coming full-circle and being reinvented. This is the “44 Bore” rifle, a colloquial name given to AK type rifles rechambered for the German 7.92 x 33 mm Kurz (sometimes referred to as 8 x 33 mm) cartridge in Pakistan. How this cartridge came to be popular in the tribal areas of Pakistan is something of a mystery. According to Muhammad Yasin of the Punjab Forensic Science Agency, the Pathan tribes claim the cartridge as an indigenous development. However, the name appears to result from either the designation of the Nazi German Sturmgewehr 44 rifle (‘StG 44’), one of the weapons which originally chambered the 7.92 x 33 cartridge, or from British 7.62 x 51 mm cartridge cases bearing the “L44A2” headstamp which were commonly reformed into 7.92 x 33 dimensions. Naming origins aside, what makes these rechambered AK type rifles interesting is that they are able to chamber and fire both the standard 7.62 x 39 mm cartridge as well as the 7.92 x 33. The bore diameter is left unchanged – 7.92 mm projectiles are simply squeezed down to 7.62 mm upon firing. This increases pressures, but not so much as to create a critical problem (though it is likely to cause headspacing issues in the weapons over time). The chambers are reamed to accept the 7.92 x 33 cartridge, which is short enough that doing so still leaves enough intact material around the case mouth for the chamber to adequately headspace a 7.62 x 39 cartridge. The rear end of the chamber remains larger than the 7.62 x 39 case – 11.95 mm vs 11.3 mm – but the case head is held in place by the bolt face. This is unlikely to be considered as “safe practice” by many experienced shooters in other countries. Left to right: 7.92 x 33 cartridge, 7.92 x 33 fired case, 7.62 x 39 fired case, 7.62 x 39 cartridge. 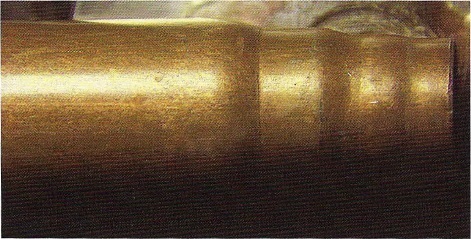 The bulging around the fired 7.62 x 39 casing, in addition to an extra shoulder, is very evident here. The motivation for the 44 Bore modification appears to stem from Pakistani gun laws. As with many other countries, Pakistan restricts civilian ownership of firearms in “military calibres”, which includes 7.62 x 39. The 7.92 x 33 appears to have been obsolete and obscure enough to escape official notice, and was not listed as a restricted calibre. By rechambering commonly-available AK variant rifles for 7.92 x 33, people could legally own rifles which just happened to be able to use 7.62 x 39 ammunition as well. According to one source, the Pakistani government closed this loophole in 2012 when they added 7.92 x 33 to the restricted cartridge list. There is little information available on how magazine capacity is affected by using 7.92 x 33 ammunition, though it seems standard AK magazines function without modification. 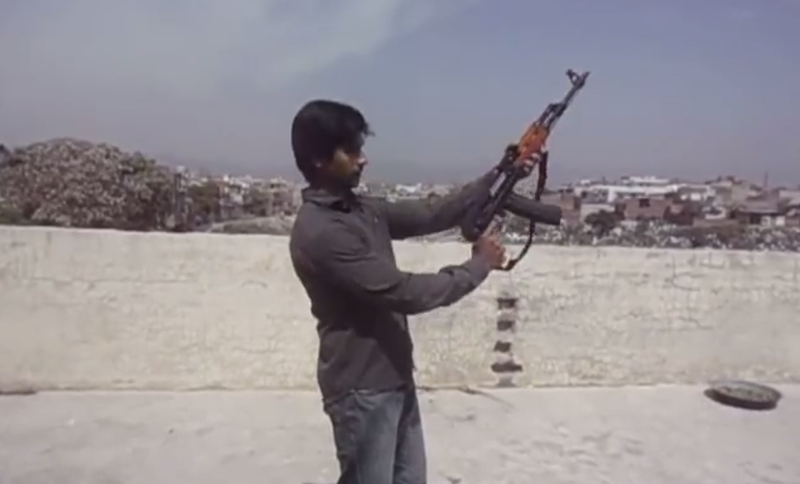 One YouTube video appears to show a 44 bore rifle using a 5.45 mm or 5.56 mm, or custom magazine. Forgotten Weapons produced the video below showing how the 7.92 x 33 cartridge loads into these different magazines. A source in Pakistan reports that his 44 bore rifle uses standard 7.62 x 39 AK magazines, and loads 28 rounds into a magazine. Feed problems appear to be fairly rare, and when they do occur are caused by the shorter case having extra space to travel to the chamber, since the magazine was designed for the longer 7.62×39 cartridge. 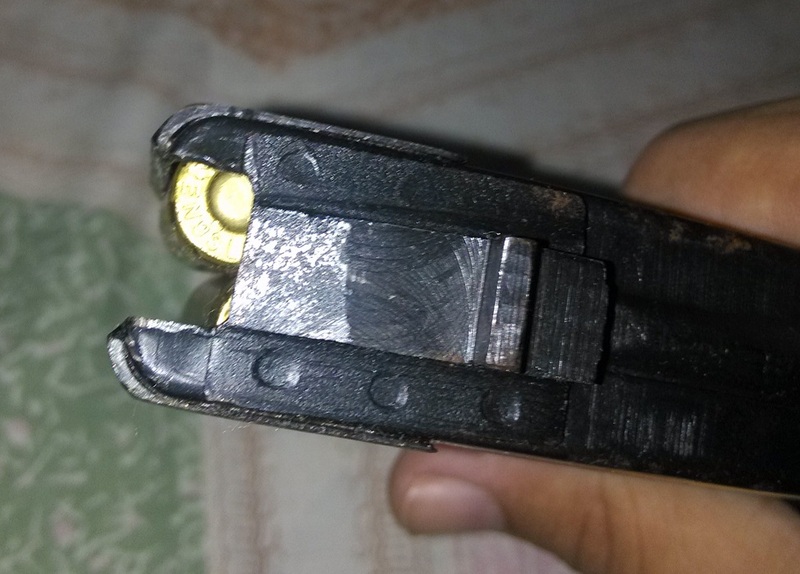 The two following photos show the 7.92x33K rounds loaded into standard AK magazines. 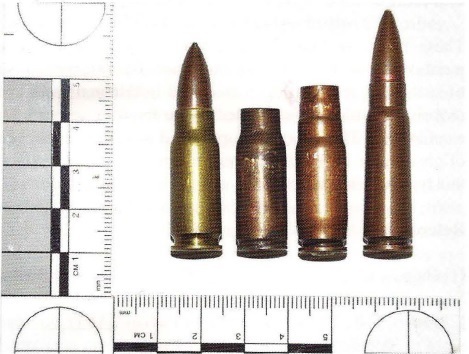 Typically, 7.92 x 33 ammunition in Pakistan is made primarily from 8 x 57 mm and 7.62 x 51 mm cases, given their availability and close cartridge head dimensions. 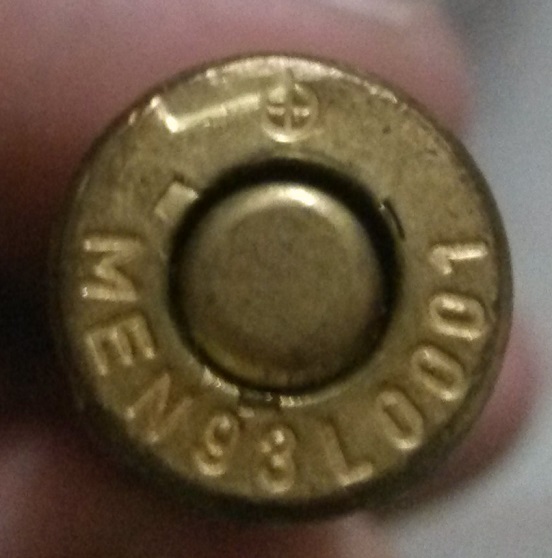 The image below shows a 7.92 x 33 round with headstamp markings that would otherwise indicate 7.62 x 51 NATO ammunition. Editor’s Note: AK type rifles have been documented by ARES in a wide range of calibres, including 7.62 x 25 mm, 9x 18 mm, 9 x 19 mm, 5.45 x 39 mm, 5.56 x 45 mm, 7.62 x 39 mm, 7.62 x 54R mm, 7.92 x 33 mm, 7.92 x 57 mm, and smoothbore variants chambered for various shotshell cartridges (and more!). Photos from Summer 2013 AFTE Journal and source within Pakistan. Top image from Khyber Arms Company. It’s not a mistery why they use AK rechambered to 8×33 – in some pakistan 7,62×39 is a military only cartridge and owning weapons for it is strictly illegal.